Above: Close up of lettering. Challenge - Student had a birthday coming up for a family member. She wanted to personalise a box to act as a gift for her Grandmother. The idea was for her box to be personalised for sewing. The student who created this project is a nine year old. Level of Difficulty: Medium. A basic box design which was personalised with the addition of the sewing machines, the sewing buttons and a star. The lettering itself was designed to work in unison with the box so had to be a specific size. Timeframe: Sixteen hours for the box. The original lettering would have added a small amount of time to the print. 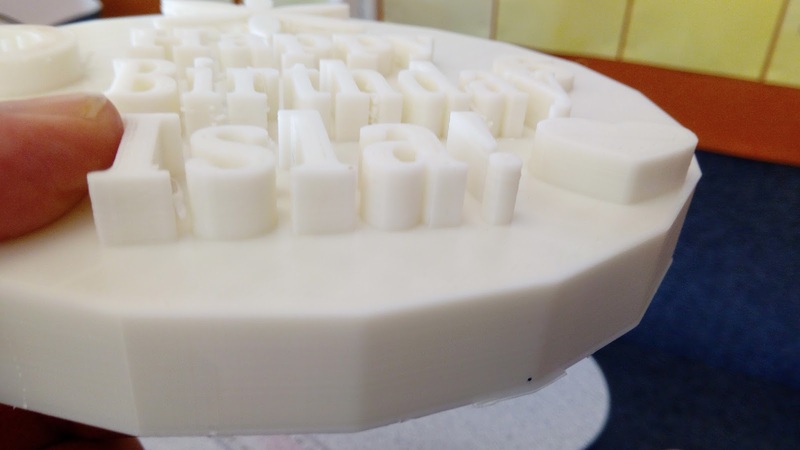 The white PLA lettering that was added to the final print took forty minutes. As a side note of time to remove the original lettering with sandpaper was extremely minimal it was three or four minutes maximum. Size: The box was essentially a 120mm box. 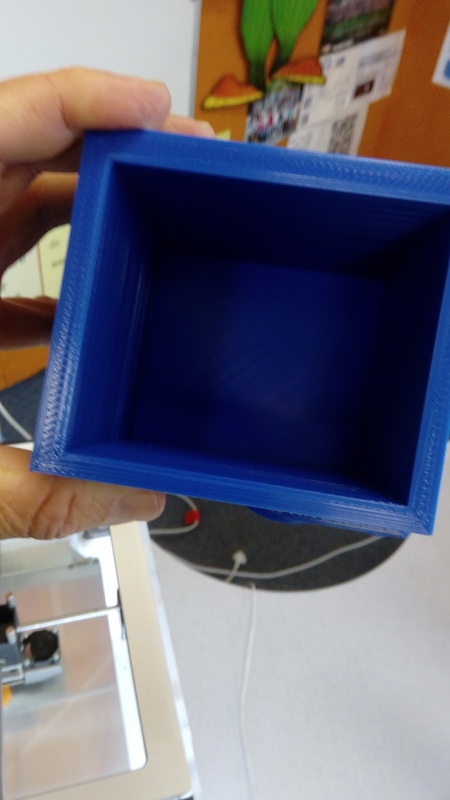 The depth of the box was 20mm. In theory this could have been reduced however the student was pleased with the box itself and wanted the size to remain. What we would do differently: We have started experiementing with mixing PLA and producing component pieces for printing. Ideally this student would have created an insert for the lettering into the base of the box itself and then the lettering could have been secured in these locations. The student is probably needing to try this with a smaller print first, to ensure that they can master the technique that they need. Next steps for students: As mentioned the lettering could have included as an insert into the base of the design. This is potentially a more advanced procedure than the current students skillset. The student needs to paint the design to complete the design presentation of the print. Challenge: Student had an iPad Mini and wanted to create a stand for that device. The student also had a cover for the iPad that she wanted to remain on the iPad, as some stands require the removal of the iPad to ensure that it fits on the stand for it. Student intended to personalise this design by adding a symbol that she enjoyed. Student is a ten year old student. Background: Student has completed several prints and is in the classroom with other students a number of whom have produced iPad stands and projects during the course of the year. Student had seen a variety of projects and used them for an inspiration for this project. She used measurements from other iPad stands in the classroom to ensure that it would work. Level of Difficulty: Low - this design can be completed by students in a very short timeframe, generally five to ten minutes. The student had a variety of projects to work from in terms of design and size to use as a guide. She choose not to personalise the design with her name as she had seen various name designs on projects and felt that the 'peace' emblem would be sufficient. What we would do differently: Very little. The student felt that the personalisation would be handled by having the peace emblem and otherwise wanted a print that would work. Both these criteria were met by print and the finished product. Next steps for the student: Student needs to move on to other projects at this project has been completed and does not require additional reworking or remodelling. 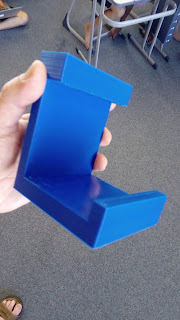 Challenge: For student to create a 3D Printed bookstand. The student wanted to presonalise this with detail and adding unique and additional features to the design. Background: The design was initially created as a bookend, however due to the design and aspects of the design it was apparent that it would allow books to be placed directly between the two sides of it, hence the potential to be used as a bookstand. The student has developed a variety of prints, a number of these have been featured on this blog. The student has shown increased confidence in creating original prints that are creative and innovative. 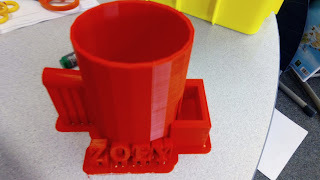 The student is a ten year old student working with 3D Printer in the classroom for the second consecutive year. Level of Difficulty: Medium. The bookstand had numerous features that were added to it, and some of these at times have proven slightly problematic. 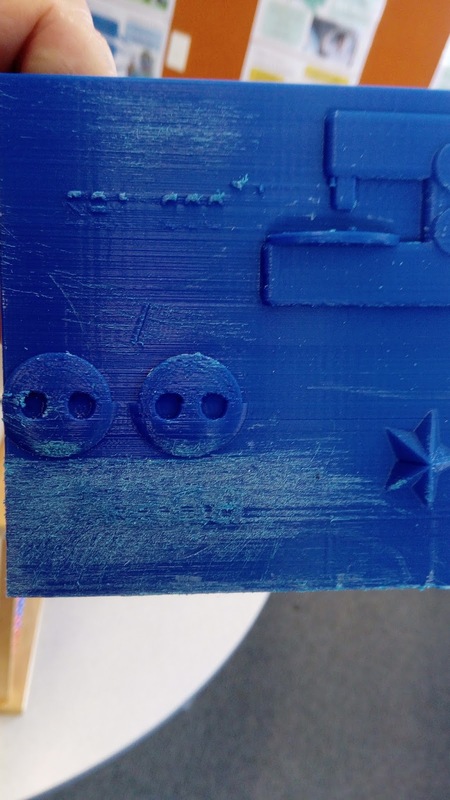 The face shown on the left, which makes the sides of the bookstand, had a significant amount of filament that required removal, and as noted in the past, this removal tends to require particular skill to remove without causing damage to the PLA of the print itself. The print of the butterfly required particualr care to remove it. Timeframe: Twelve hours. The entire print was created, designed and run in a single print. Given the dimensions of the print and the purpose of it, which evolved into having books sittiing inside it, the print size and subsequent time to print it would be the minimum required. The exception would be the additional features that were added to the print in the design by the student. Size: The base of the design was a 100mm by 100mm square. The butterfly base, which was at the end of the design was of a similar dimension. The sides of the bookstand, created by the emoji were essentially a similar dimension but were round in shape. 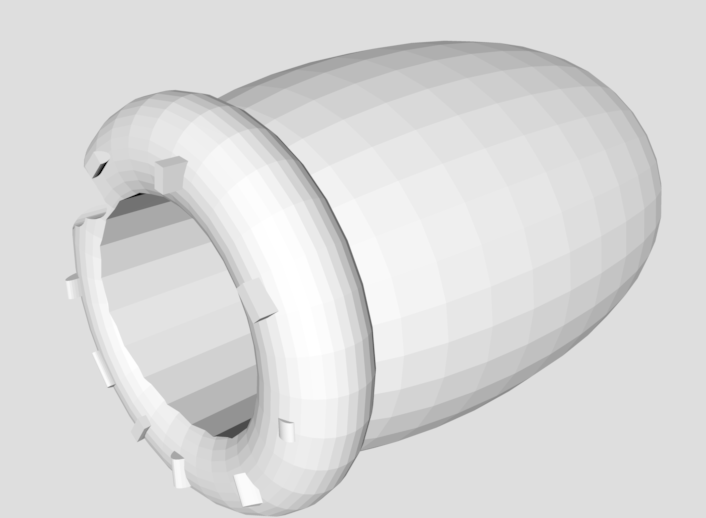 The thickness of the design varied from point to point but the width was generally in the range of 50mm. The butterfly wings of paricular note were only 2mm thick in places. What we would do differently: The student tried to put as much features into the design as possible, She almost created too much material for the design. She also had the 'tounge' part of the emoji design which went past the base of the design, creating a slighlty uneven design. Ideally she should have adapted this part of the design so that the tip of the tounge joined to the base of the design. Next stepss for the student: The student could have refined the design to ensure that it concentrated on a small number of additions to the design. Obviously the student needs to check their prints before the final print run to make sure they balance as perfectly as possible. 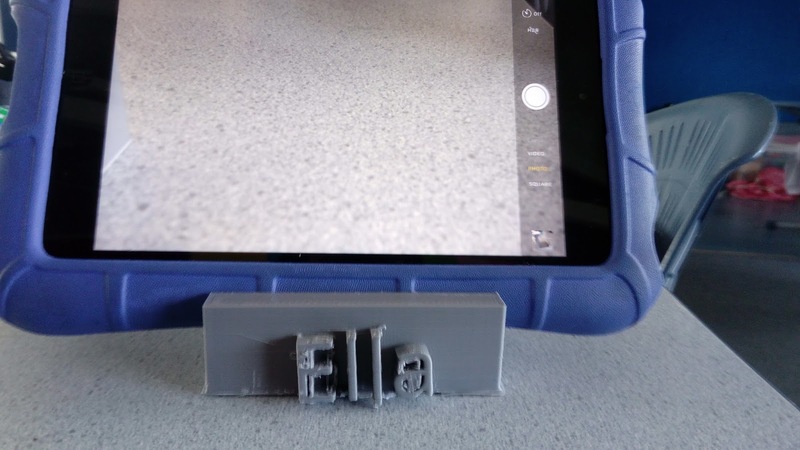 Challenge: For student to create a 3D Printed personalised bookend for their own use. 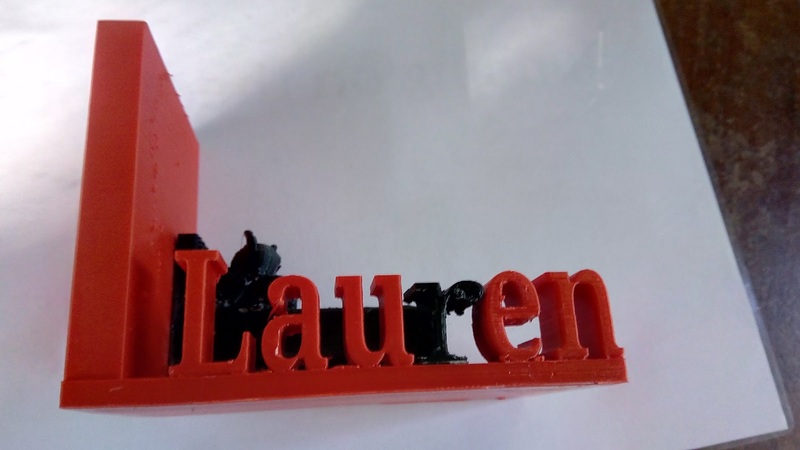 As an additional challenge students were asked to combine a minimum of two different PLA print colours for extra effect. rafting' of the PLA for the design, the 'r' became removed from the design. The student then had to design a replacement letter of the same size and design of the original, except this time in black. The bed aspect of the print, which was the second major feature was also sized to complete. Level of Difficulty: Medium. 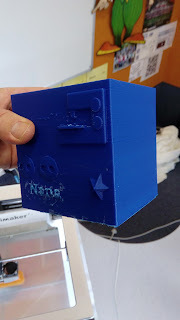 We are looking at ways to extend students in a practical way with the 3D Printers that will produce a print that will be workable, have a practical purpose and produce a print with a finish. Obviously the degree of difficutly could have been increased by having multiple letters reprinted, potentially in multiple colours, and the bed could have been designed from scratch (as it was it was a created print sourced from a 'Tinkercad' search. Timeframe: The base of the print, which was the red with the original lettering was eight hours. The black addition of the bed and the letter 'r' was a further four hours. The combined print in this case was twelve hours. The block part of it, with the base, could have been increased with additional weight and design. However as it was the design met the expectation of the student. Size: 130mm long, 80mm wide and 5mm deep. The end of the print was 80mm wide, 100mm high and 10mm thick. The lettering of the students name was 25mm high. What we would do differently: Other than the student looking to mix up more of the PLA between the two colours, the design, being individualised and unique met the students brief and was extremely successful. Next Step for the Students: We have had discussions with students about mixing up the PLA colours with the different prints being run. The challenge is for ways to integrate this into different print designs without compromising the designs themselves. Challenge: To create a personalised gift commenerating a special event (in this case a birthday). Background: Student had been somewhat inspired by a previous print detailed on this site, from February. She had seen this design and its influence on this design is clear to see. 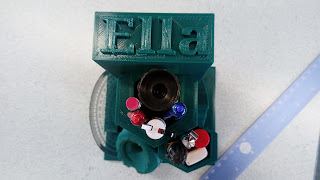 Initially a plan had been to spray paint the design, however the student (Y6 - ten years old) was extremely pleased with the finish created by the white PLA and decided for it to remain as it was. Level of Difficulty: Low - its a basic template design, with the addition of the lettering and some of the generic designs accessible from the main screens. The font selection was the default. Timeframe: Twelve hours - there were significant design changes would have reduced this time, relating to the depth of the print. At 20mm deep it could have been halved which would have reduced the time of the print significantly. Size: The design measured 15cm across, which was identical in size to the original print. What we would do differently: The student was thrilled with the design and the finished product. The student herself did not want to change any aspect of the design, despite the points noted above which were discussed with her. Next Step for the Student: The project and print are essentially completed and done and the student would move onto other challenges and projects. This is a updated version of a print already detailed here in several posts. The initial design, in red, was for a student desk organiser which consisted of a named block, sunk into the back of the design and two hexagonal cyclinders which were the storage components. The original design had a twelve hour print time, and was student created. 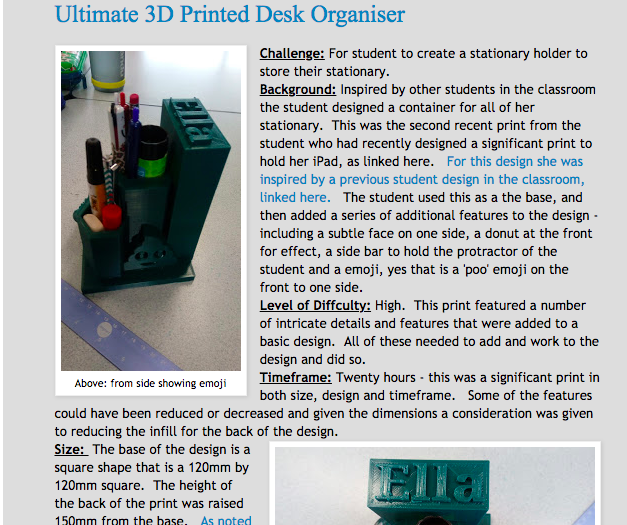 In the revised version, which was labelled the 'ultimate' desk organsier, a student took this initial student design and added additional features to the outside of the design to further personalise it. (emoji, a donut, face and a side bar to hold in place a protractor). As a result of these further changes the print time was increased to a tweny hour print. This revised version, shown left, focussed on reducing the width of the cyclinders where the stationary was stored. In the original version these were 25mm thick. This version reduced the width of the cyclinders to 5mm. It also removed the emoji from the side. The consequence of this was the revised printing time which is now reduced to twelve hours. The design has also included a bar, which can be seen in the right had side of the design to allow a protractor or a small ruler to be held. Above: Emoji design, yes it is. Challenge: To demonstrate the 3D Printer with a quick personalized print, that could demonstrate the capability of the 3D Printer. (Ahem). Background: Most of the prints on this site have an extended print time due to the size, purpose and nature of them. Occasionally the students want to demonstrate something the opposite of this, a short term print that can produce something quirky, or humours. One example that students had come to me with was the emoji shown in the photograph. 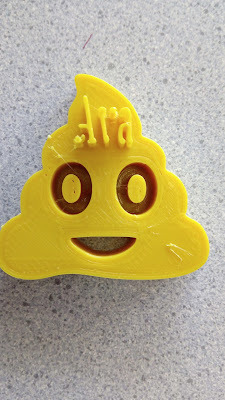 The students were able to show that it would have a purpose, as a label and were able to personalize the design, and argue that they could use it as an exemplar, which would allow a quick print (in the twenty minute range for each emoji). Its a bit of 'fun' if nothing else and was given consideration before the decision to print was made. Apparently a student would use this to mark their bag or their possessions. Level of Difficulty: Low - this is a generic design, which has been re sized for purpose and has the addition of the students name on the top, as a consequence the student who designed this was able to achieve all these things in an extremely short space of time. A small design note - the rafting on the back of the design was deliberately not removed as it allowed the eyeballs to hold in place. Time frame: twenty minutes was enough to complete the print. They are relatively small (see notes on dimensions). We printed a group of six of these designs (each a copy with a variation of the students name) on a single print run which had a combined print time of four hours. Size: 60mm wide, a height of 60mm and 5mm thick. The purpose of this design was to produce something that was recognizable, and could be massed produced quickly so while it could be re-sized it would somewhat defeat the intended purpose. What we would do differently: The students wanted something for a specific purpose and could have experienced with something slightly more appropriate, however students wanted something humorous, recognizable and small and like all the best prints they completed the process. Next steps for students: Something that was original and not a stock copy. Challenge: For student to create a personalised stand to hold his iPhone. 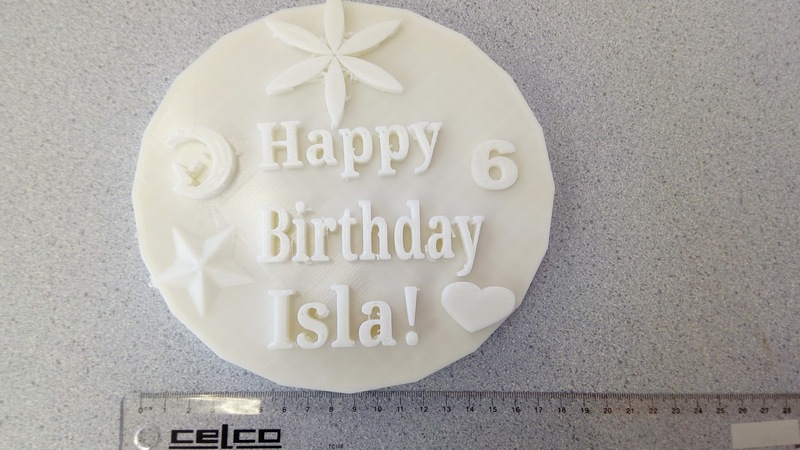 Student who created this print is ten years old and has a shown a talent for 3D Printed design and creation. Background: Student is able to produce a range of prints and designs and has been increasingly complex and innovative. 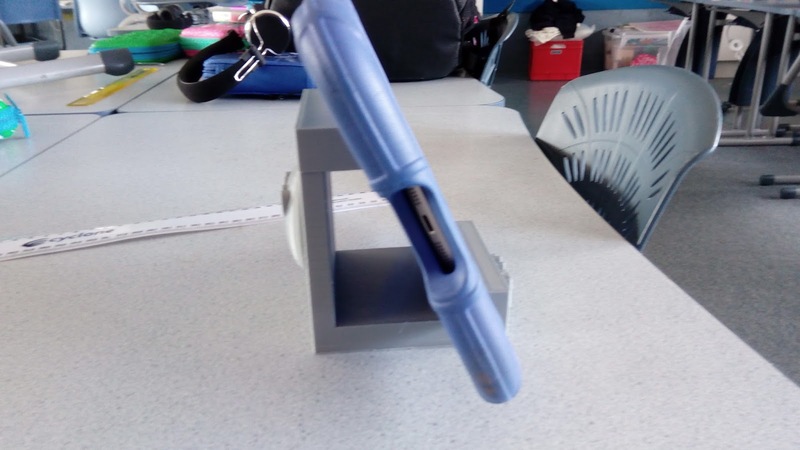 In this example he had a desire to create a stand for his iPhone so that he could locate it easily have it promently displayed in his room. Level of Difficulty: Low-Medium. The design itself is realatively straight forward. He took an available template (the drone template) and decided to convert it to personalise it for his use. He included a name, sunken into the top of the base, added additional backing plate and sunk a design to catch the iPhone. Time Frame: Twelve hours. There was a change required to this print, which were the feet on the base of the design. These were too thin and came away when the rafting at the base of the design was removed. Taking these out of the design did not alter the design and therefore should have been removed from the plan. This would have had a significant improvement in the printing time. 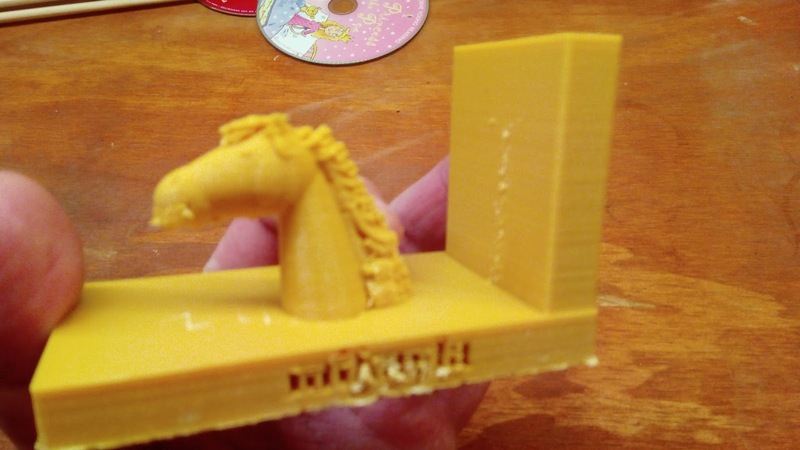 As previous prints, 20% infill (internal printing of the printer), Tinkercad used to create the design (including having a design featured from the main Tinkercad interface) followed by being converted to CURA for printing by the Ultimaker 2+. Size: The front of the design measures 160mm across and is 180mm long. The base plate is 100mm by 100mm. The block that supports the iPhone and has the name of the student on top is 65mm high, 25mm thick and 10mm long. The depression to base the iPad is 85mm by 35mm and 10mm deep. Relative to the size of the phone these dimensions would be the minimum that would be required for this particular print to be successful. What we would do differently: The issue that needs to be addressed is the legs. This design needs to potentially be lifted up off the ground, from a display perspective and the student has twice attempted to use legs that have been too thin and removed either partially or fully when the rafting has been taken off. The student is currently designing additional legs and a base for this design to compliment its creation. Next Step for students: As above. The design itself was created by a ten year old student so some conferencing has resulted in more discussion about its shape and production. 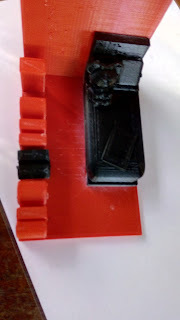 The student could have printed parts with seperate PLA filament and then assembled with superglue or other connectors to produce a layered affect with the colours. Currently a group of students are working on a series of print ideas based around making a bookstand. The students have been experimenting with different designs and shapes backed onto the bookends. In these draft designs students were primarily determing the size and potential design of the bookends. Some students were using third party created material (as shown in the photographs) to enhance thier design. There were variations in the design of the lettering for the names. These designs will expanded on in further posts including a detailed discussion of the projects and following through the production process. 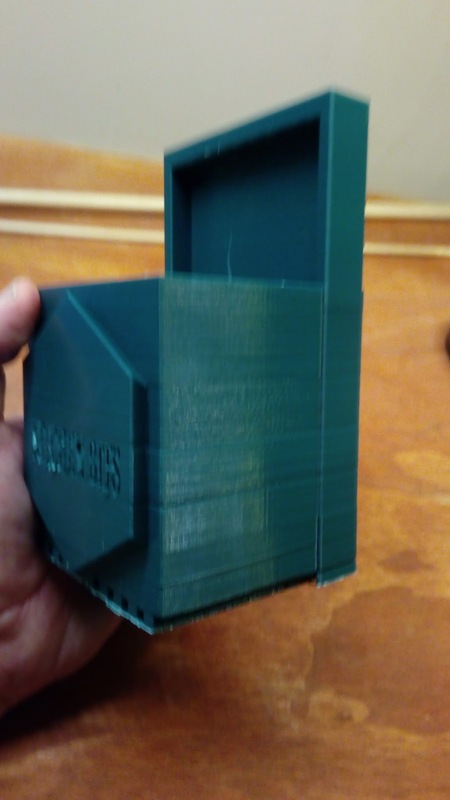 Estimated print times for this will be six hours. Students have used a variety of additions to the print. 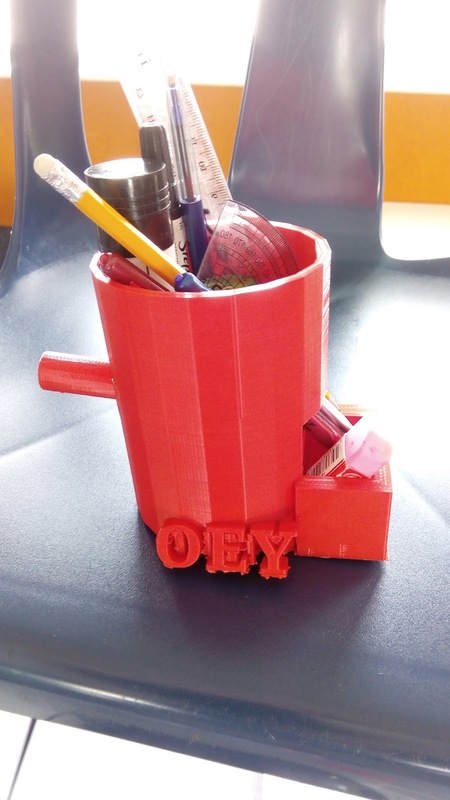 Challenge: For student to create, design and print an original utility holder for use in the kitchen. Background: Once they've completed the basic designs in the classroom the students have been challenged to create original and unique projects that have a meaningful application and use. 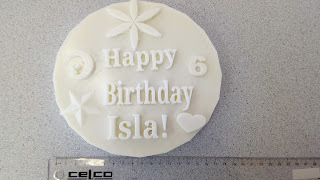 This student in question was looking to design something original for various kitchen items. 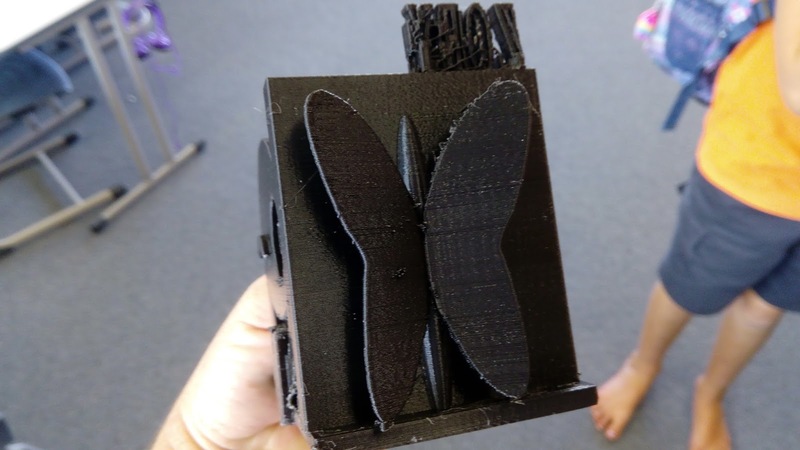 Student (who is ten years old) is having their second year of classroom opportunity with the 3D Printers in the classroom. Level of Difficulty: Medium - aspects of this print could have been modified, particularly with its purpose (see below) and there were aspects of this print that could have been altered so that it worked more successfully (particularly the base). Time frame: Ten hours - aspects of the print could have been changed, however overall the design met the brief, dependant on the size of items that were to be stored in it. This is an 8mm nozzle, on regular settings with a 20% infill (which are all the standard default settings). Size: The dimensions of the front of the design is 90mm across by 80mm deep. The back of the design is 100mm across and a further 150mm high. The width of the design is 5mm except for the back, which creates a base by being 10mm thick. change to be considered is the purpose of a container like this - while the intended purpose was for a kitchen utility holder, one thought was to have perhaps a classroom token box or a classroom container that would hold universal items (such as markers etc). Depending on that purpose then a way to mount the container on the wall etc. should have been considered. Furthermore as shown in the illustration the bottom part of the badge design where the angle touches the base is slightly below the base of the design. This is why the student hasn't removed all of the filament as it would cause the design to be slightly unbalanced. Next step for student: To redesign the base to ensure that it wasn't sticking below the floor of the design. The lettering itself could have been designed differently and made bigger to ensure that it was more detailed with the printing. 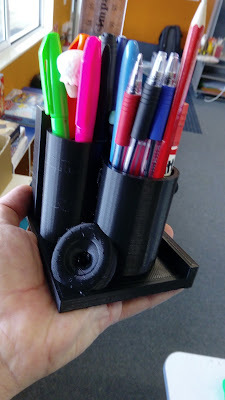 Challenge: To create a piece of utilitiy holder suitable for holding pens/pencils (but also have the potential as a general holder of items). 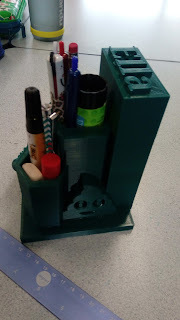 Student who created this is a Y5 student, nine years old in her first year of using 3D Printing. 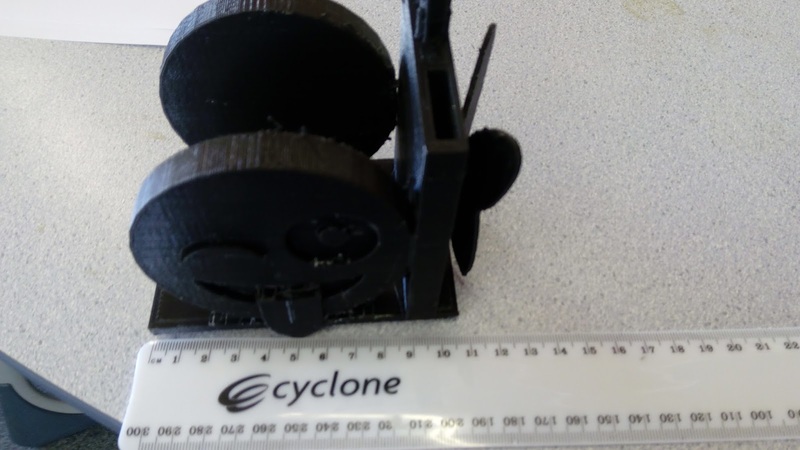 Background: Student has shown some creation and invention with various projects related to 3D Printing in the classroom. Student is designing a series of prints and creation and conferencing with the teacher with regards to their originality and purpose. This design, while it would appear complicated comes primarly from the main Tinkercad Interface, which has a series of basic designs that students can take and reshape, redesign and ensure that they meet the criteria for the purpose set above in the challenge. 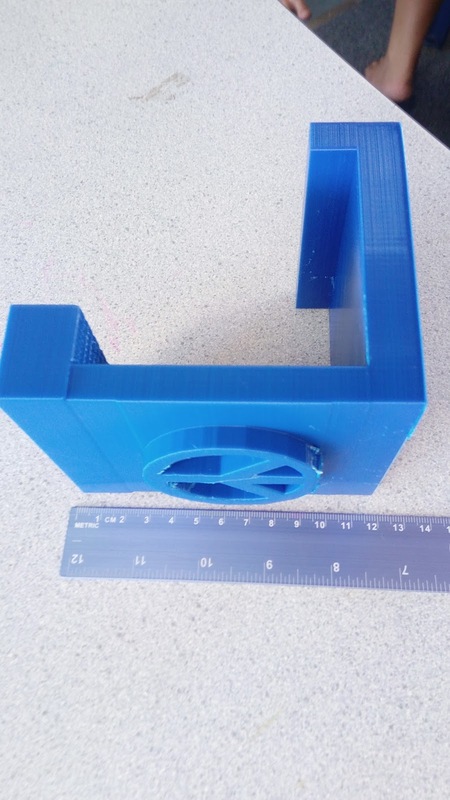 Level of Difficulty: Low - while the design is exactly what the student had in mind (see below) the essential issue here was the redesigning of the shape created by Tinkercad and ensuring that it was able to meet the purpose. 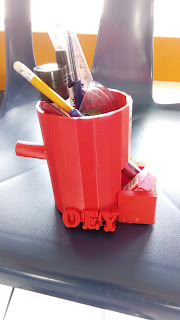 In this case the student needed to redesign the shape to meet the purpose of holding pencils and general items that the student wanted to store in it. The size, relative to the design, was perfect for the design. Timeframe: Twelve hours - consideration could have been given for the infill used in this design, to reduce the density of the print to still complete the purpose. Every design on this site, has always used the basic default settings for the infill, most printing software will allow you the opportunity to alter the level of filling it. The default setting on the CURA software (which is the Ultimaker 2 in-house software) is at 20%. It creates a series of connected lines in a crosshatch form which prove to be the strength of the object. We have not experimented with reducing this infill, however the strength of the prints featured on this site have not been in question, as we have (after three years) yet to have significant damage to the produced items, which seem to be extremely durable and robust. Size: The width of this desing was 100mm. The height of the design was 100mm. The width of the design was 25mm at the top. Conceivable the width of the design could have been reduced to reduce the length of printing time. What we would do differently: The student obviously missed an opportunity to personalise the container with their name or the purpose of the container (however the student was adamant that they wanted this container to be multi-purpose and not restricted to one purpose as it would have been if it was created with a label). Next steps for students: To show other students (and teachers) how to produce material/projects of a similar nature. This student has mastered this type of project and needs to extend herself in other ways. 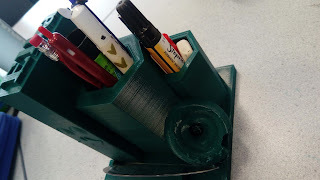 Challenge: For student to create a stationary holder to store their stationary. Background: Inspired by other students in the classroom the student designed a container for all of her stationary. 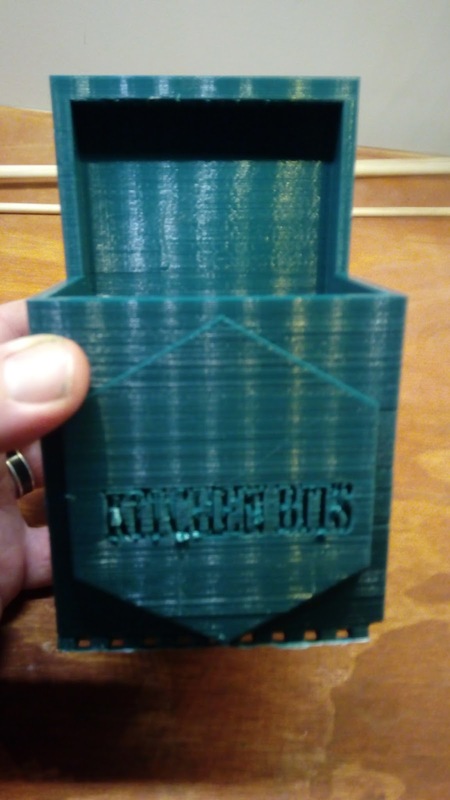 This was the second recent print from the student who had recently designed a significant print to hold her iPad, as linked here. For this design she was inspired by a previous student design in the classroom, linked here. The student used this as a the base, and then added a series of additional features to the design - including a subtle face on one side, a donut at the front for effect, a side bar to hold the protractor of the student and a emoji, yes that is a 'poo' emoji on the front to one side. Level of Diffculty: High. This print featured a number of intricate details and features that were added to a basic design. All of these needed to add and work to the design and did so. Timeframe: Twenty hours - this was a significant print in both size, design and timeframe. Some of the features could have been reduced or decreased and given the dimensions a consideration was given to reducing the infill for the back of the design. Size: The base of the design is a square shape that is a 120mm by 120mm square. 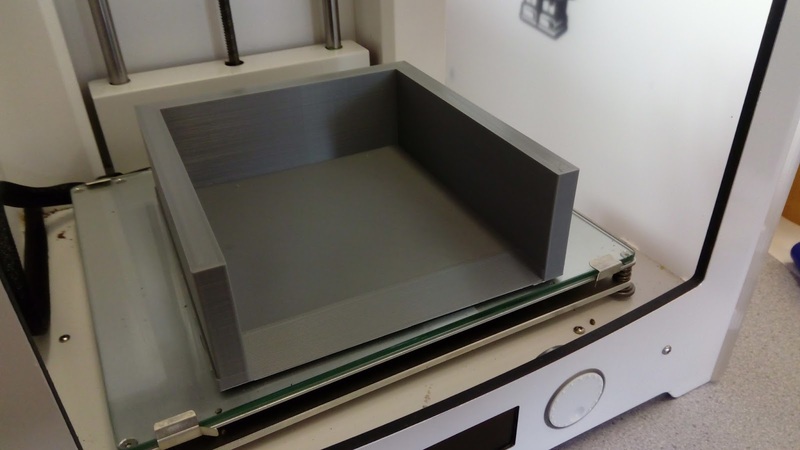 The height of the back of the print was raised 150mm from the base. As noted in the previous print that this was used as base. The first tower included in the printer was 65mm high. The second tower was 100mm high. The name block that was at the back was raised 135mm. The purpose of this design was to hold a variety of stationary items. What we would do differently: The width of the hexagonal design for the different levels of the container was 25mm thick in places. This could have been reduced to 10-15mm and would have served the same purpose for the design and would have reduced the overall print time. 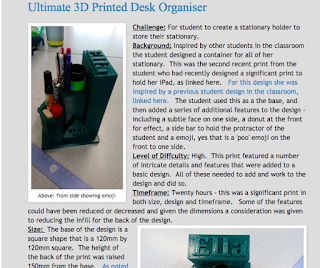 This particular design has been described as the "ultimate" desk organiser in the sense that there is not additional features that could be added. 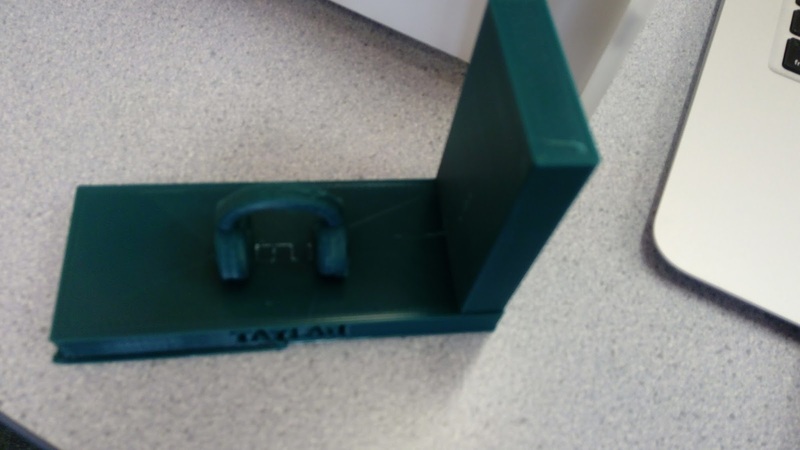 The only aspect that students have been attempting to solve is the issue of a headphone holder, by either introducing a bar or a holder. There have been a number of attempts at modelling this however these have proven to be unsuccessful as the bar designs have caused all the models to tip or a high degree of likelyhood of tipping has taken place. Next step for students: This student could have designed the project from start, instead of using another design as a basis for design. She could have reduced the width of stationary holders and reduced the level of infill. Challenge: For student to create an original way to store items of importance to her. simply resized this. This meant that she had a series of three identical prints, that were increasing in size of the same object and created a set of them. Level of Difficulty: Low - this design is from a third party where the student has modified it to suit her purposes by adding the possibility of storage in the back. The process to complete this sort of design is limited to the five minute (total) range. 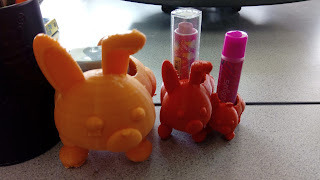 Timeframe: the largest rabbit in the series took ten hours to print, the middle sized one was six hours and the smallest one (shown on the right in the photograph above) was three hours. Given the nature of the design being third party these print times would reflect the fact that this would be a minimum to complete the print. Size: The smallest rabbit came in at 60mm in length and was 30mm wide and 50mm high. The middle one was 90mm long, 40mm wide and 40mm high. The largest of the thrre was 100mm in length, 60mm wide and 70mm high. What we would do differently: None - given the brief, the experience of the student and the design focus the task was completed and the student was extremely pleased with all aspects of it. Next steps for students: Indepdent designs where she is taking the process forward by creating original projects and work. Challenge: For student to create and personalise a stand to be used by the student in the classroom/home as a stand for an iPad Mini. Background: Student was looking to create something original and had seen other examples in the series from students in the classroom. She was intent on making sure it was more personalised that could be easily identified as hers. The student who was involved in this print was ten years old. 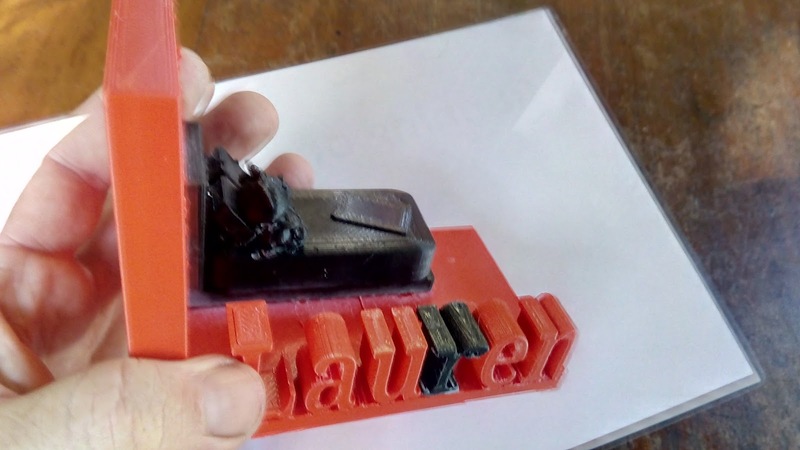 Level of Difficulty: Medium - this was elevated from a basic print by the addition of two features that would be identified the emoji that was created and the name of the student on the base. We have been discussing with students the addition of extra features to these iPad stands (such as a bar for headphones) or additional storage. Student opted not to do this as a result of the print being one of her first. Timeframe: 12 hours. 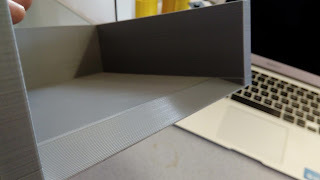 This print had limited rafting (rafting is the additional printed material which is removed once the print has completed, in the picture shown, the rafting has been removed and allows for the overhang that you can see shown. Given the need to balance the stand to ensure that the iPad stand serves its purpose, the minimum time length required would be reflected by this design. second block (as shown) that was 30mm by 100mm. 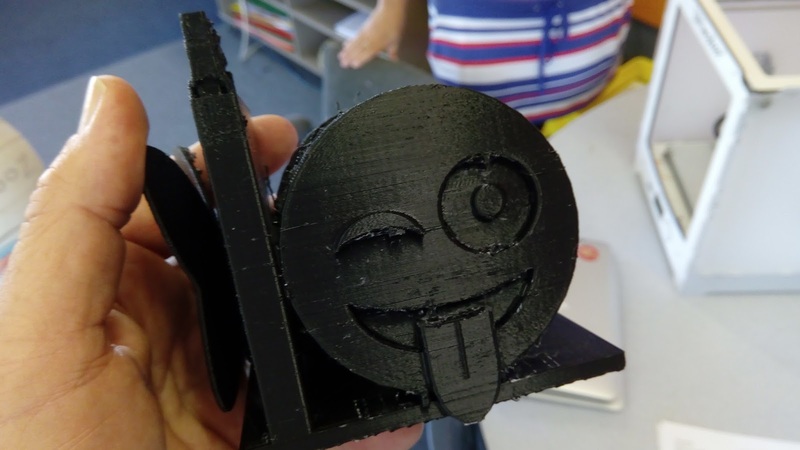 Finally the Emoji part of the design was created from scratch by the student (using basic shapes design from the Tinkercad Interface). Realistically these dimensions would be the minimum that was required to successfully complete this project to ensure that the iPad stand will work. an iPad resting on it. Next steps for students: As noted the lettering while it was successfully requires some touching up to ensure that it achieves a finished look. The student choose not to add additional features as stated (a stand or opportunity for the storage of headphones). 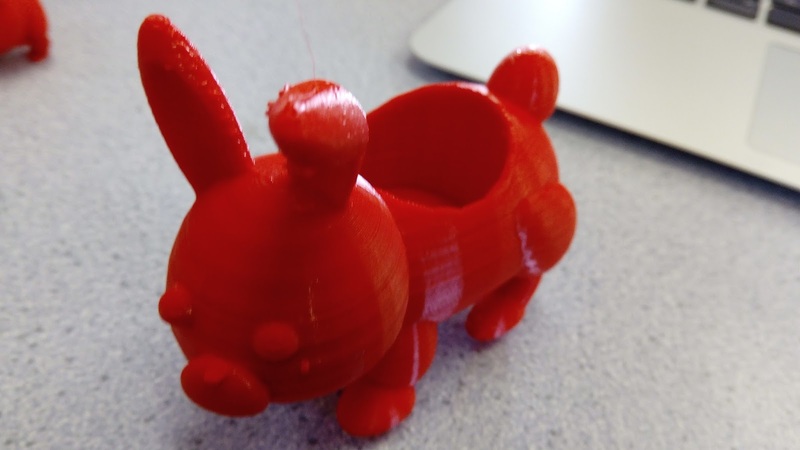 Challenge: To produce a 3D Print to work as an extension for a toy. Background: This student has been responsible for a number of innovative and creative projects, which have been featured on this blog. In this instance the student had a specific prop/accessory that he wanted to produce that matched a toy (tractor). A silage pit is essentially a concrete structure that is sunk into the ground (there is a link to an explanation on Wikipedia) which serves as a storage pit for fodder for animals (in this case cows). The student has a series of farm related commercial toys and models but did not have a specific silage pit, and hence decided to create one, using the 3D Printer. This was created to scale with the models that were purchased by the student commercially. Level of Difficulty: Low - the structure in essence is reproduced here but is essentially as it is shown. The lip that is present allows access for tractors to move material from the pit. There is no additional features that needed to be created relating to the design, other than sizing it correctly. Timeframe: Sixteen hours. This was a particularly long print, but the student was specific that he wanted the dimensions of the silage pit relative to the model/toy of the tractor. Given the dimensions and the specifics of the printing (again 8mm/Tinkercad/regular print settings). Size: 16cm tall and 12cm wide. The wall itself had a width of 1cm for the sides and the base. The lip was the exception, which was the creation of a ramp with the intention that it would allowed wheeled models to move freely up and down the ramp, and into the model fo the pit. Again relative to the dimensions of what the print was to represent, relative to scale this print needed to remain the size that it was for it to be realistic and meet expectations for the student. 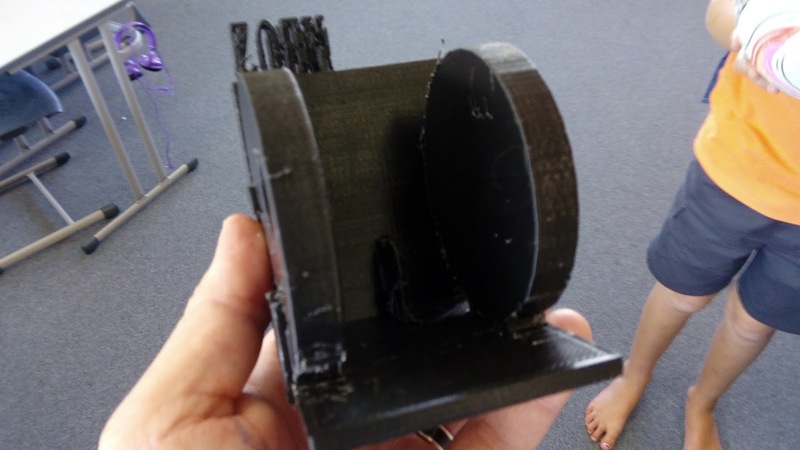 (Teacher and student did discuss the model, the students reasoning was he wanted the print to remain basic to represent a silage pit, and the student was adament that the print needed to remain as it was). What we would do differently: The student was very determined in his brief and production of this print, it was discussed that he could have produced a brick affect on the walls of the silage pit, however the student felt that this was not always the case and he had other material that he wished to use to represent the silage that would be contained in the pit. Next step for the student: The student has already indiecated that he would look into producing specific farm related material to compliment the designs and the commercial toys. He wanted to take an opportunity to produce specific items that relate to his specific farm. This would be more of a challenge. Obviously the brick design mentioned above could have look at the texture of the walls. Silage itself is organic matter so it could be attempted as a 3D print potentially. Above: Design prior to rafting removal. Challenge: For student to create, design and print a 3D Print that would allow the storage of student in the classroom. Background: Student has had experience with other students in the classroom producing a series of prints in this range. She wanted to personalised her print, and also include an ability to hang her headphones from the design. Furthermore she was looking for specific space for a sharpner to build into the design. 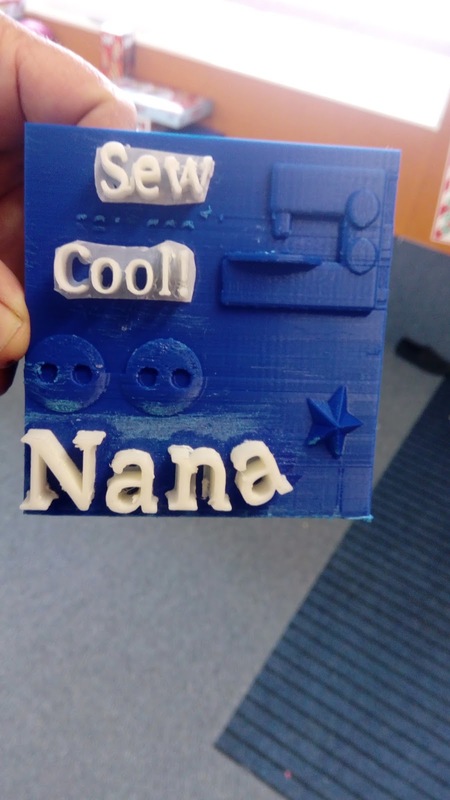 Student is ten years old and was working independently in her own time to produce this design, which was created in Tinkercad. It was sent back for several redesigns as the initial plans had seperated parts that needed to be grouped correctly. The student was working independently for the first time on a significant project. Level of Difficutly: High - this was elevated from some of the prints in the series because of the additional features. The name was attatched to the base of the design, on the outside. The bar designed for the headphones was partially successful. The insert for the sharper did not acheive the desired size to house the sharpner, however the idea itself was inspiring. Timeframe - Fourteen hours, a significant print. As per normal 8mm nozzle and regular PLA, a Tinkercad Import and then a print on CURA (The Ulitmaker 2 Software). Significant revision of the design would be required to be successful. Size: 11cm by 10cm across. A height of 12cm. The headphone holder was 4cm across. Revision of this print would require considerable reworking and design. What we would do differently: The headphone rest/bar needed to be increased in length (although not to the point it would cause the design to tip). The base of the design (the main circular shape) was fine. 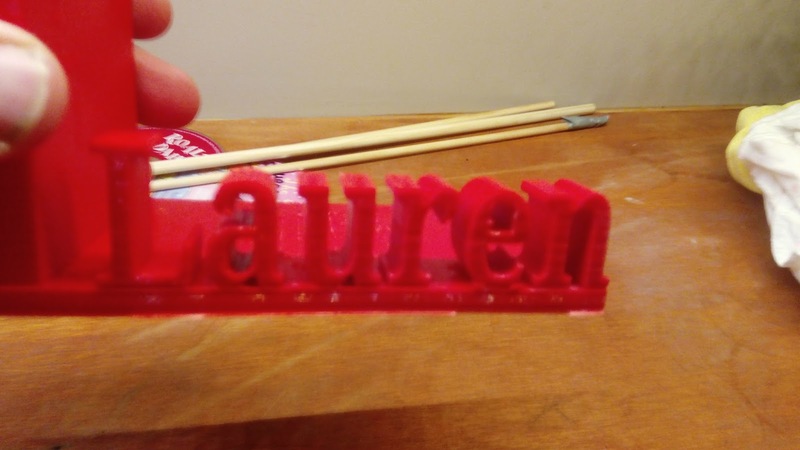 The names on the front, the 'Z' detached from the print and we were intending to superglue it back into place, however this would mean it would be out sync with the other letters in the name. The sharpner holder at the back needed to be resized. A major talking point was that a trap door could have been included for the emptying of pencil sharpning. Another potential difference that could have been altered was the additon of some feet or base, potentially of another colour PLA. The feet would then be superglued into place. Next steps for the students: Student is aware of the issues that need to be resolved with this print, however she is so proud of it she is using it in the classroom for its intended purpose while she redesigns and we reprint her work. This will be reposted when it is completed and amended. To put this into perspective as stated this student is ten years old and designing projects for the first time. She has included some original ideas in her print that while they need reworking they are showing innovation and will be inspiration to other students.